Back row, from left: head coach Teresa Juergens, Stella Hashimoto, Willa Kong, Eva Patrick, Karena Everts, Hadley Orr, Charlotta Bell, Allie Oxnar, James Bell; front row: Sophia Williamson, Abigail Gardner, Makena Gong, Keelin Doherty, Monica Symonds, Vivian Carter (not pictured). 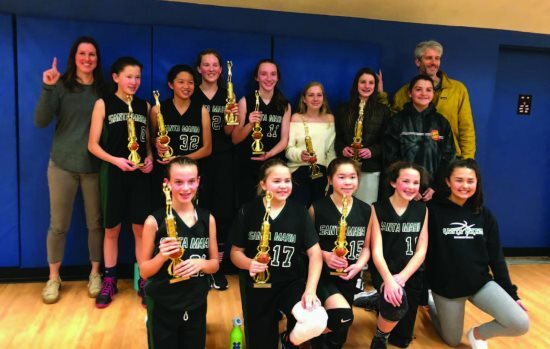 On Sunday, Feb. 24 the Santa Maria CYO seventh grade basketball girls' team won the 2019 West Diablo League CYO National Division tournament championship, defeating St. Perpetua (Lafayette) 34-25 in the championship game. 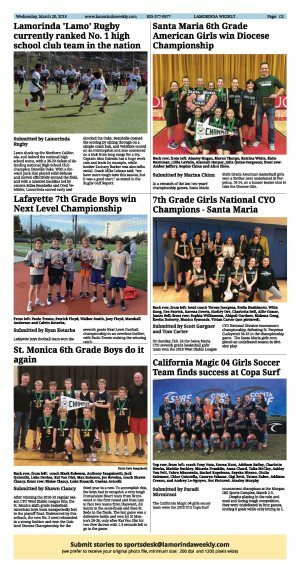 The Santa Maria girls completed an undefeated season in division play.